Sir Richard brought this story to my attention, which I believe is an interesting story about why it's so important to keep a journal. 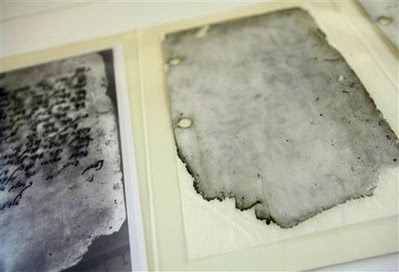 Pages from an Israeli astronaut's diary that survived the explosion of the space shuttle Columbia and a 37-mile fall to earth are going on display this weekend for the first time in Jerusalem. restored diary will be displayed at the Israel Museum beginning Sunday. "It's almost a miracle that it survived — it's incredible," Zalmona said. There is "no rational explanation" for how it was recovered when most of the shuttle was not, he said. 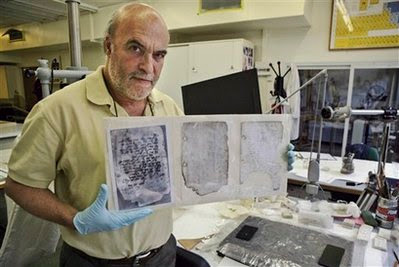 The U.S. space agency returned the diary to Ramon's wife, Rona, who brought it to forensics experts at the Israel Museum and from the Israeli police. The diary took about a year to restore, Zalmona said, and it took police scientists about four more years to decipher the pages. About 80 percent of the text has been deciphered, and the rest remains unreadable, he said. The diary provides no indication Ramon knew anything about potential problems on the shuttle. Columbia's wing was gashed by a chunk of fuel tank foam insulation at liftoff and broke up in flames just 16 minutes before it was scheduled to land at the Kennedy Space Center in Florida. All seven astronauts on board were killed. The diary is being displayed as part of a larger exhibit of famous documents from Israel's history, held to mark the country's 60th anniversary this year. Also on display will be Israel's 1948 declaration of independence, the 1994 peace treaty with Jordan and a bloodstained sheet of paper with lyrics to a peace anthem that was carried by Prime Minister Yitzhak Rabin at the time of his assassination in 1995. ...and it came down in Palistine, (texas ) now what are the chances of that..
Yeah! Actually I missed the irony of that one! Good catch Sir D of O! I didn't catch that either, good one Davyd. Could it mean that there is a chance of the two sides coming together? Hope springs eternal. As a sidelight, I have always maintained that the cause was a blown tire. The hole in the wing caused the tire to overheat, and being a two piece wheel when it blew up the explosion sent shrapnel cutting through the craft. Just a layman's opinion. How ironic is it that the letters to enable this to go through are nukkd !!! Maybe no hope for peace afterall. If all my journals were destroyed in a fire (or whatever) and only a page survived, what would I want to be on that page? Sir Bowie, that is a great thought and a great motivator for my future journaling. Right now there's a 50/50 chance that my journal would either have something very profound or something about me avoiding a bar fight!